A piece of cut glass hangs in our kitchen. 710 has had it since before we even met. It has hung at either his or our place of residence ever since. 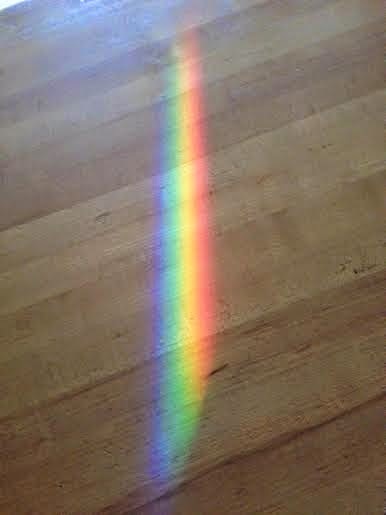 Only on certain mornings, at certain times of the year, does it refract light in our kitchen. This month it has happened quite a few times. Since we're heading into June, which is typically Pride month, I figured why not use this image as my outgoing pic of the month? Honestly, I'm not a fan of most Pride events, but you've read about that here over the years. I'm not a fan of the gay flag either. Nor do I feel the need to have rainbow patterns on my clothes, under clothes, wallets, stem wear and kooky hats. I know it has its purpose, but it is not my style. Still, a rainbow looks like Spring and Summer. This is it folks. The was last Pic of the Day in May entry. Not all were winners, but I think there were a few interesting shots. It was fun to do, and not too taxing. I suppose if this meme is brought up again in 2015, and I'm still around and still blogging, I would participate. Hey, you always have to prepare for the worst, right? Thanks to Jim for goading me into doing this. nice! congrats, you made it to the end! You did a great job on the pic-a-day challenge. Loved what you photographed!